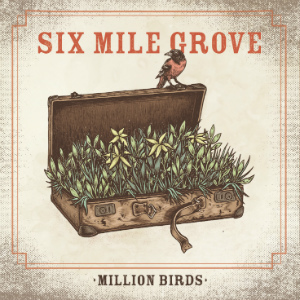 Million Birds is a new album from Minnesota band, Six Mile Grove. One lesson I’ve learned over the years is that this style of music, which blends elements of roots, country,and rock’n’roll is difficult to classify to anyone’s satisfaction. A band once angrily wrote to me after I reviewed them and insisted that they were “not a country band, they were “a blue and roots Americana band!” Six Mile Grove’s music similarly blurs the line between genres, and the result is awesome. Million Birds is really good. It’s mellow, emotive rock’n’roll with vintage, 1950′s vibes and a bit of backwater goodness. The singer reminds me a bit of Buddy Holly (both in vocal tone and appearance.) The performances on this album are excellent all around. This is honestly some of the best music I’ve ever heard from an “indie” band. In a just world or a different time, their song Not My Fault would be a top ten hit. Unfortunately we live right now though, so bands like this have to go through a lot of hoops just to be heard by anyone. The good news is that now you know about this album and get to listen to it. Million Birds is authentic, avant garde and evokes a sense of nostalgic innocence from beginning to end.